I know I shared with all of you the loss of our grand dog Penny about a month ago. My younger daughter Kim was mom to Penny. Penny was a 5 year old Dachshund that had a spinal condition that left her paralyzed and they were unable to do the surgery to correct this issue so we lost the fight to keep her. It was a very sad time for all of us especially my daughter. 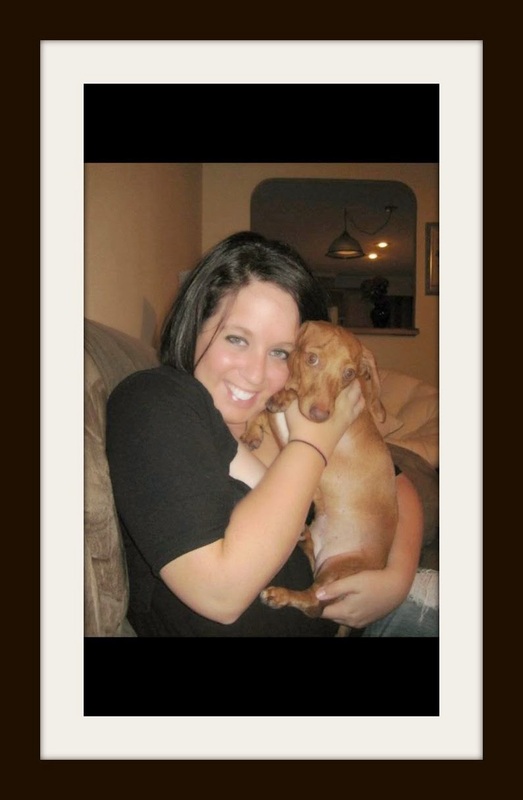 My daughter Kim with her little Penny. My daughter is a nurse and works with cancer patients which can be sad many days so she always loved coming home to her little Penny waiting and excited to see her after her shift. It has been really hard for Kim to not have Penny there and part of her life. 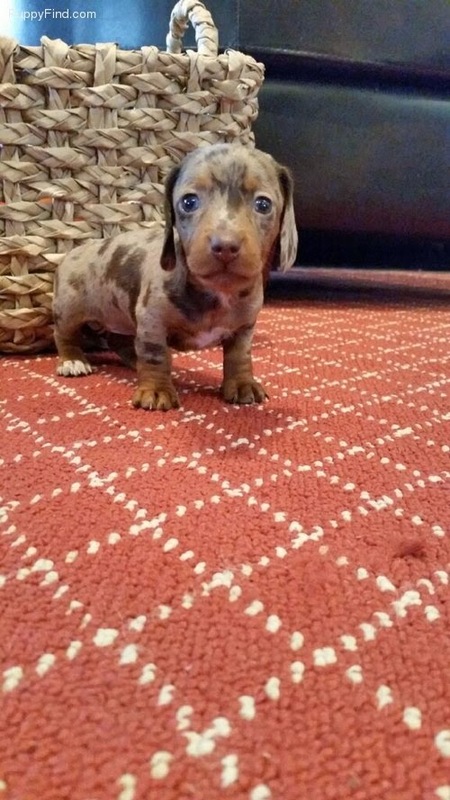 So Terry and I decided to surprise Kim for a Mother's Day Gift and gift her a new little dachshund. Her name is Snickers. She is a Reverse Chocolate Pie Bald dachshund. Does she not have the cutest little face ever!!!! She is not old enough to come to her forever home until the first week end in June. So we are all excited to have her coming soon to live in our family. Look at her cute little white back paws. It is like she has slippers on. Just thought this would be a good post before Mom's Day Week End. I want to wish all of you a great Mother's Day. Be sure to check back on Saturday for Spotlight I have another wonderful blogger in the Spotlight. Have a great rest of the week and all you wonderful mom's have a great week end. What a sweet little baby! I'm so sorry for Penny's lose, but I bet she's smiling down on this little sweetie coming to help ease your daughter's heart! What a sweet and thoughtful thing to do! Oh my goodness...that IS the sweetest face ever! That is one very lucky dog that will be showered with love and affection. :) Happy Mother's Day to you, Kris! So cute and a lovely thing to do for your daughter. Happy mothers day! Oh my gosh, Kris. Best give ever. How adorable is Snickers?! Don't you just want to EAT him???! Oh Kris, she is beautiful. I just want to pick her up and give her lots of hugs. So sorry for Penny's loss, but a new puppy. She is going to have such fun with her and I am sure Snickers will love coming to grandma's house and playing with Libby. How adorable she is and I love her name! Your daughter will be so happy coming home to her! I'd also like to thank you for praying for me Kris, I'm doing good and had a great doctor's appt. he removed the staples too! What a sweet gift and such a cute puppy! O M G . . . what a sweet tiny face!! Lucky Kim!! Oh.............my..............goodness!!!!!!!!!! She is SOOOOO cute! I want her! I love her name too. I bet your daughter hates waiting so long to get her too. What a generous and loving gift you gave her. I hope that Snickers brings her many years of happiness. Snickers is adorable, what a lovely and thoughtful gift for your daughter! I'm so excited for you! Snickers is cutie! Snickers is adorable and your gift to your daughter Kim is priceless. Too too cute this little one. Oh my gosh, Kris, Snickers is just the cutest ever! Does your daughter know about her yet? She is so sweet, and what a dear Mother's Day gift! I am so excited for your daughter, what a happy pair they will be! I am teary eyed just thinking of it all!! OH, Kris, Snickers is precious!!! I just love that you guys are doing this...Kimmie will be giving her a good home, and hopefully this will help ease the loss of Penny a little. So cute! I love the name too. Snickers is a little angel! You made my entire week and weekend with this post. Happy Mother's Day to your wonderful family Kris. Oh my gosh Snickers is ADORABLE! What a great name too - perfect for her coloring. Your daughter must have been so happy and excited. Says a lot about your daughter's heart to be able to work with cancer patients. I can't get enough of this doll. I keep looking at the picture. I sent it to all my doxie loving friends. This made John and I want to watch the DVD we took of Peanut and Reeses when we first met them at the breeder. Happy Mothers Day to you and to new mommy Kim!!! oh, how darling! i love her speckles and coloring. she is sure to win your daughter's heart, kris:) happy mom's day to you! What a cutie pie! That face is so sweet, and Snickers is such a great name. Snickers is adorable!! What a wonderful new addition to the family! Oh my what a cutie and love the coloring! Welcome to your new family addition! Love your guest room, ever so pretty and love the magazines handing on the door! I did the same think to my kitchen chairs, I found a ruffled skirt and cut the ruffles off to make chair skirt, loved the fact the ruffles were already made. Now I'm looking for another ruffled skirt. Your chair look really nice with them. Have a very happy Mother's day! Snickers is adorable and will be soooo loved by Kim. What a beautiful Mother's Day gift you have given her Kris. So sorry about Penny ! This little puppy has the cutiest little face and those paws !!! ❤️❤️❤️ Blessings to you and yours !! OH. MY. GOSH. That is the most adorable dog ever!!! She is so beautiful and hopefully will help your daughter's heart heal over the loss of Penny! I hope you have a most wonderful Mother's Day weekend! Hugs!! Oh my Kris, Snickers is absolutely precious! What a sweet gift for your daughter. I can see lots of puppy love coming your way. Happy Mother's Day my friend! An adorable little baby!!! I had a weenie dog when young and it had some kind of back condition so my dad came up with the idea of using a rebuilt skate board for her. It gave her support and she got around great!It had padding and she took to it quite well! A funny sight but worked. Oh, my word if that isn't the cutest thing!!! Y'all are just too sweet to get her that little love muffin! Happy Mother's Day, Kris! OMG!!! She is just beyond precious.... and what a cute name too! Just the sweetest little face and the sweetest gift. I am sure your daughter is thrilled. What wonderful work she does. We've had a lot of very sick people in our family as of late and I have to say, it's the nurses that really make the difference. :) Happy Mother's Day! What a sweet little puppy! Snickers is a wonderful gift and surprise for your daugher. I love her markings. There will never be another Penny but Snickers will help heal her heart. That is great news for your daughter. It's an adorable puppy, such beautiful trusting eyes. I hope you'll share more pictures later. Happy Mother's Day to you! I'm so sorry that your daughter lost her sweet Penny, Kris. Snickers is such a cutie and I'm pretty sure, she'll be able to distract Kim. Penny will never be forgotten but it helps to take care about another furry baby. What a wonderful gift to your daughter!